Date of judgement: March 12th, 2003. Md Abdur Rashid J: This appeal was presented by the sole appellant Badal Kumar Paul under section 410 of the Code of Criminal Procedure against judgement and order dated 13-11-2000 passed by the Sessions Judge at Jessore in session case No. 39 of 1999. The judgement convicted him under section 19(1) Table 3 (kha) of the Narcotics Control Act, 1990, and sentenced him to imprisonment for life. The prosecution case, in short, is that on 5-11-97 at about 9-10 AM the police found 250 bottles of phensidyl, each contained 100 ml and 72 pieces of Indian woollen mufflers worth of Taka 32,200 in the possession of the appellant in front of Mallik Bari at village Tahepur under Chougacha Police Station, Jessore. The police seized the phensidyl and mufflers in presence of witnesses and arrested the appellant and lodged a FIR under aforesaid section of the Act. In the trial, the appellant along with co-accused Nowsher Ali were charged under sections 19(1) Table 3(kha), 19(4) and 25 of the aforesaid Act to which both of them pleaded not guilty and claimed for trial. The prosecution examined eight witnesses while the defence none. Their common defence was of innocence and that no phensidyl was recovered from their possession. PW 1 Inspector Sheik Abdur Razzaqe testified that on 5-11-97 he was posted in the Directorate of Narcotics Control at Circle Benapole. At a tip-off, he along with ASI Abdul Hannan, Habibur, Harun-or-Rashid, Mohiuddin and Abdur Rahim reached in front of Mallick Bari at village Taherpur under Chougacha Police Station and waited in an ambush. At about 8-50/8-55 A.M they found two persons were coming towards them along the road carrying jute bag over the head of one. When they reached in front of Mallick Bari, they came out from both sides of the road and asked them what was inside the bag. At about 9-00-10-00 AM, by opening the bag they found 250 bottles of phensidyl in five paper cartons and 72 pieces of woollen mufflers. They seized the articles in presence of witnesses and sent one bottle of phensidyl for chemical analysis. They arrested the appellant Badal Kumar Paul but co-accused Nowsher Ali managed to flee away. Then, he lodged a first information report under aforesaid provisions of law. PW 2 ASI Abdul Hannan, PW 3 constable Mohiuddin and PW 7 constable Harun-or-Rashid corroborated PW 1 Sheik Abdur Razzak. PW 4 was a resident of the house near Mallick Bari. He testified that on 5-11-1997 at about 9-00/9-30 AM he saw people gathered on the road. He went there. They asked him to sign a paper. He saw the seized articles inside the car but he did not know what were the articles. He also identified his signature on the seizure list. He did not see the accused not did he see the arrest of Badal Kumar with the articles. He denied that he witnessed the arrest of the accused with the goods and now, was deposing falsely under the influence of the accused. PW 5 Raju Ahmed testified that on 5-11-97 he found many people gathered near Mallick Bari. One official asked him to sign on a seizure list but he declined. Then, his signature was taken forcibly. He however identified his signature on the seizure list. At this stage, he was declared hostile and cross-examined by the prosecution. In such cross-examination he denied that having witnessed seizure of 72 pieces of mufflers and 250 bottles of phensidly he signed the seizure list. He denied that he witnessed the arrest of the accused with the goods and now, was deposing falsely under the influence of the accused. He stated that it was not true that being neighbour and old acquaintance of the accused he was concealing the truth. PW 6 Abdul Awal, a chemical examiner, was posted in the CID, Dhaka. He stated that on 12-11-97 a sealed parcel was received in the office of the Narcotics Control Directorate at Jessore from constable Harun-or-Rashid. In the parcel, 100 ml of liquid was in a glass bottle. He held the chemical examination. The bottle was found properly sealed and signed. He also identified his signature. He found Chlorpheniramine Maleate and Codeine Phosphate in the sample. Said Sheik Abdur Razzaque was again examined as PW 8 as the investigating officer. He testified that he investigated the case and after receipt of the chemical examiner's report he submitted a charge-sheet. After close of the prosecution evidence, both the accused were examined under section 342 of the Code of Criminal Procedure and both of them claimed to be not guilty. Upon the aforesaid evidence, the learned judge found the appellant only guilty and accordingly, convicted and sentenced him and co-accused Md Nawsher Ali not guilty and acquitted him. We have perused the entire record and heard the learned advocates at length. We have also examined the Act and Ordinance. In the trial, seven witnesses were examined. Of them PW 1 to 3, 6 and 7 were police officials while PW 4 and 5 were locals, who witnessed the seizure by signing their names on the seizure list prepared. PW 2, 3 and 7 in one voice corroborated PW 1 Sheik Abdur Razzaque over seizure of aforesaid articles. PW 4 and 5 though identified their signatures on the seizure list but denied to have witnessed any seizure of the articles. In view of the facts and circumstances of the case and the evidence on record it did not appear to us that the seizure list witnesses were telling the truth in the trial. After close scrutiny, we could not find any reason to take any view different from that of the Adalat that the prosecution successfully proved the seizure of 250 bottles of phensidyl and 72 pieces of woolen muffler from the possession of the appellant. However, no charge was made against the appellant for possession of 72 pieces of woollen mufflers nor do we find any charge of smuggling was levelled. Both the accused were charged only under item No 3 (Kha) of the Table following Section 19(1) of the Narcotics Control Act, 1990 for unauthorised possession of phensidyl. The main issue now facing us is whether the carrying of the phensidyl is an offence under the Act. More precisely, whether phensidyl is contraband within the mischief of the Act. The Act was promulgated with the object to control narcotics and to provide for treatment and rehabilitation of narcotic (drug) addicts. It is intended to regulate and control manufacture, marketing, trade, use, etc of the narcotics as described in schedule-1 to the Act. Section 2 (Tha) of the Narcotics Act declares the substance or articles described in the first schedule to the act as narcotics. Schedule-1 comprises of three categories of narcotics. In Serial 3 of (Ka) class of narcotics, we find mention of opium derivatives, namely, Morphine, Codeine, Thebaine, Nascapaine, Narcotine, Papavarine, etc and their alkali. Sub-section (1) of section 9 prohibits cultivation, production, processing, carrying, transportation, import, export, supply, purchase, sale, possession, preservation, storing, exhibition or use of all narcotics except alcohol. Sub-section (2) prohibits cultivation, production, processing, carrying, transportation, import, export, supply, purchase, sale, preservation, conservation, storing, exhibition and use of any substance or plant that may be used in the manufacture or production of any narcotics. Under sub-section 3 of section 9 of the Act, it appears that use of the schedule narcotics was never intended to be outright banned. Under licence or permit any of them could be used for manufacture of medicine or scientific research. Even under clause (Kha) individual use or consumption of such narcotics appears to be allowed but under permit. The Act appears to be harsh and the sentence prescribed thereunder is very severe. Promulgation of the law is no doubt felt and intended for public health and for the good of the people. In interpretation of such law, the court is always required to be very conscious of the purport of the law. It must first have a clear understanding of the schedule narcotics under the Act, which are prohibited for use, purchase, sale, import, export, transportation, carrying etc without licence or permit. At the outset, we must record that we find no mention of phensidyl either in schedule-I or in the table following section 19 of the Act. Possession or carrying of such phensidyl therefore cannot be said to be a punishable offence under the Act. A bottle containing 100 ml of phensidyl was sent for chemical analysis and report. PW 6 Abdul Awal, a chemical examiner, deposed that on examination, he found presence of Chlorpheniramine maleate and codeine phosphate in the liquid of the bottle. He, however, did not mention the amount or proportion of any of such substances in 100 ml of the bottle. Mr Awal submitted that when codeine was prohibited as a narcotic, phensidyl containing any derivative from such codeine must also be held to be a schedule narcotic. Possession or carrying of phensidyl is therefore a punishable offence under serial No. 3 (ka) or (kha) of the table. In order to understand what is codeine phosphate, we must understand first what is codeine. Codeine phosphate is no doubt a derivative from codeine. Codeine is always available in the nature as alkaloid of opium. Such alkaloid is nothing but a poison just like venom of a snake. A derivative from any such substance namely, codeine, is extracted by chemical process either by synthesis or methylation. Opium and morphine are extracted from a plant popularly known as poppy. By methylation or chemical process opium and morphine are extracted from one type of poppy. Both opium and morphine are found as compound. In opium, presence of codeine is from 0.8 to 2.5% and in morphine 10 to 15%. Codeine is obtained from morphine through methylation. It may also be obtainable from opium. Codeine phosphate is commonly used as a derivative of codeine. A derivative is also a compound obtained by methylation or synthesis. Properties and/or use of derivative of a substance or chemical would be different. Say, sodium chloride, in chemistry, is written as NaC1, is used in our daily life as common salt. Sodium and Chlorine in particular proportion make sodium chloride, which is definitely different from sodium and chlorine. Neither sodium nor chlorine will individually meet the needs of our common salt. Similarly, codeine phosphate is a derivative of codeine. In both United States Pharmacopoeia and British Pharmacopoeia, we find use of codeine phosphate as medicine in form of tablets, capsules, elixir, injection, or syrup; (Cf United States Pharmacopoeia, page 416 and 417, Asian Edition, 1995 and British Pharmacopoeia, 1980, Vo1 1 page 122 and 123). An addendum, 1986 of British Pharmacopoeia, 1980 use of codeine phosphate as codeine linctus. It is described as small colourless crystals or a white, crystalline powder odourless. Further, we find that under section (iii) of the drug policy declared in 1982, the use of codeine in any combination was sought to be not allowed as it causes addiction. But the Drugs (Control) Ordinance, 1982 promulgated on 11 June 1982 has not included any such prohibition in the use of codeine phosphate. We find use of codeine phosphate in our country as cough suppressant in indication of dry or painful cough; diarrheas; pain. We also find use of Chlorpheniramine maleate as sedative antihistamines(Cf Bangladesh National Formulary (BDNF), 2001, pages 127 and 129 respectively published by the Directorate of Drug Administration in association with the Bangladesh Medical Association and the Bangladesh Pharmaceutical Society). In these drugs, codeine phosphate is used in prescribed quantity. Say, Codeine Linctus contains in 5 ml 15 mg of codeine phosphate. Its main use as analgesic; hypnotic; sedative in medicine. It need not be mentioned that any such drug may be misused by overuse by exceeding the prescribed limit. During our research, we found that heroin is also obtained from morphine and acetyl chloride. Its chemical name is Diacetylmorphine. Its properties are white, odourless, bitter crystals or crystalline powder; poisonous; habit forming drug; soluble in alcohol. It is derived from morphine by acetylisation. It was earlier used in medicine, mainly, as narcotic, analgesic. Because of its addiction liability, the importation or manufacture of Diacetylmorphine and its salt is now forbidden in the USA; (Cf Merck Index, an Encyclopedia of Chemicals and Drugs, Eight Edition, 1968 page 337 and the Condensed Chemical Dictionary, fifth edition, page 352). Import, export, transportation, carrying, use of heroin in Bangladesh is also prohibited. ii. Refined, unrefined, manufactured opium or any substance made with opium. iii. Opium derivatives, viz Morphine, Codeine, Thebaine, Noscapaine, Papavarine, etc. and their alkalis. iv. Any substance containing more than 0.02% of morphine. In view of the above categorisation, a decision as to whether any substance is a schedule narcotic under the Act cannot therefore be said to be divorced from a consideration of its purity or potency. When a drug is very costly propensity for contamination cannot also be excluded. In prescribing punishment, we think, the weight of such narcotic weighed heavily with the legislature. As Court of record, the responsibility on us is no less little. Be that as it may, the case in hand is different, not covered by the above decision. In view of item No. 4 of class (ka) schedule-I of the Act, absence of any finding of the percentage or quantity of codeine phosphate in 100 m1 of phensidyl has made the submission on behalf of the State altogether devoid of any substance. 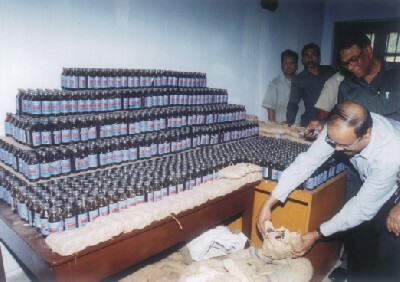 As stated above, codeine as a derivative of opium is included as a narcotic within class (ka) of schedule-I and violation of any provision of sub-section (1) or (2) of section 9 of Act in respect of opium, cannabis resign or narcotics derived from opium is made punishable under serial 3 (ka) or (kha) of the Table following section 19 of the Act. Notwithstanding the prohibition, sub-section 3 of section 9 of the Act has allowed use of any such substance, namely, codeine phosphate, in medicine. Codeine phosphate is no doubt a derivative of codeine, which in turn comes from opium. In the absence of any law declaring phensidyl contraband, presence of Chlorpheniramine maleate and/or codeine phosphate in phensidyl will not make it contraband as a schedule narcotic. We have already seen both the substances are being used in medicine as analgesic, antihistamine, cough suppressant etc. even in our country. Therefore, carrying or possession of the phensidyl seized is not a punishable offence under serial 3 (ha) or (kha) of the Table following section 19 (1) of the Act. Before parting, we must record that the axiom that the ignorance of law is no defence requires the law, particularly such harsh law claiming life, should be simple and flawless for easy understanding of the people on the street. If the Government thinks that use or consumption of phensidyl is hazardous or harmful to public health, it should come out with proper legislation. Without the backing of a law, it has got no right to prosecute and harass a citizen. In such view of the matter, we do not find any basis for conviction and sentence of the appellant for possession or carrying of 250 bottles of phensidyl. In the result, the appeal is allowed. Order of conviction and sentence is hereby set aside and the appellants are acquitted of all charges levelled against him. M Shamsul Hoque, Advocate for the Appellant. Sk A Awal, Deputy Attorney-General with Saifuddin Md Aminur Rahim, Assistant Attorney-General for the state.